The sixth edition of the NASCAR Toyota All-Star Showdown will feature two days of exciting action among some of the nation’s greatest short-track drivers in NASCAR Camping World Series and NASCAR Whelen All-American Series competition. 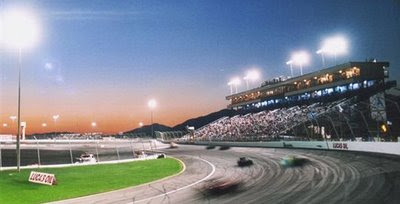 The prestigious postseason event, the ‘Daytona 500 of short-track racing,’ is slated for Jan. 23-24, 2009 at Toyota Speedway at Irwindale (Calif.). In addition to the NASCAR Camping World Series, which is NASCAR’s top developmental series, the NASCAR Whelen All-American Series will be featured in Late Model and Super Late Model competition. The series is the weekly racing, grassroots foundation of NASCAR. Both nights of all-star action will be aired live on SPEED, which has broadcast the event in each of its first five years. Broadcasts will begin at 7 p.m. PT each night. It will be part of a packed weekend on SPEED that includes the Rolex 24 at Daytona sports car event. A full day of on-track activity kicks off for the NASCAR Camping World Series on Friday, Jan. 23 with practice and qualifying, leading up to the 250-lap feature race on Saturday, Jan. 24. Thirteen drivers have each already secured a spot in the NASCAR Toyota All-Star Showdown by winning a NASCAR Camping World Series race this year. In addition, champions of each of NASCAR’s developmental series also earned secured spots in the event. Other positions in the starting lineup will be determined through time trials, which are slated for 6 p.m. on Friday, and limited provisionals for NASCAR Camping World Series regulars. Rounding out Friday’s activity for the NASCAR Camping World Series will be a “Last Chance Open” race at 9:10 p.m. that provides drivers one final opportunity to make the final 40-car starting grid for Saturday’s feature race (all times listed Pacific Time Zone). The NASCAR Whelen All-American Series Super Late Models will also be featured on Friday, with qualifying at 4 p.m., and the 150-lap Super Late Model race set to go green at 7:35 p.m.
NASCAR Whelen All-American Series Late Model action, meanwhile, gets underway Friday afternoon with practice. Qualifying is set for 1 p.m. on Saturday, leading up to a 75-lap Late Model race that is scheduled to start at 7:12 p.m. The NASCAR Toyota All-Star Showdown weekend will be capped off with a 250-lap feature event for the NASCAR Camping World Series, with the 40-car field set to take the green flag at 8:31 p.m.
To purchase tickets for the NASCAR Toyota All-Star Showdown, fans can go to www.toyotaspeedwayatirwindale.com or call the track at (626) 358-1100.